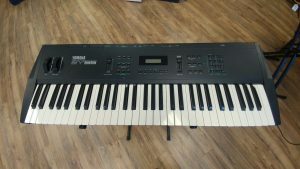 A rare chance to grab a Yamaha SY55 Late 80’s/Early 90’s synth. I’ve not used the Sequencer nor the MIDI for decades and never used a ROM card. I can’t see why they wouldn’t be working but it is a case of buy what you are seeing given it’s age. The lowest black key (C#) works but needs looking at as the “spring” action isn’t working and the key itself is loose; I’ve tried to show this on the photo above but it isn’t showing very well. Also, there is a chip out of one key as shown in the photo. 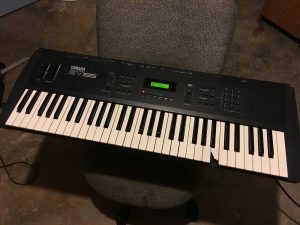 Keyboard in great playing condition. Apart from top A key – key still sounds but spring is broken…see picture (easy fix). “Cosmetics: Good Condition. There are some scuffs and scratches. Overall, really good shape. has a few scratches on the case and an issue with one key not being raised back to the original height – may simply be a spring that needs adjusting but I dont want to open it up myself. the key works but this is the only issue with this fantastic vintage keyboard – everything else works perfectly. lack of use and space means I need it to go. I reserve the right to end the auction early as is advertised locally elsewhere. 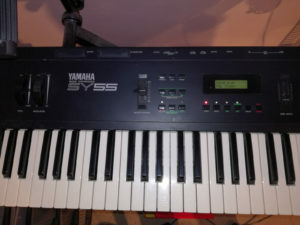 Verkaufe den Synthesizer Yamaha SY55 (ohne Tasche). Optisch ist das Gerät in einem sehr guten Zustand und auch funktionsfähig. Der Synthesizer ist sehr stabil, da das Gehäuse aus Metall ist und nicht aus Kunststoff. Die Taste “C” im oberen Bereich muss repariert werden, da anscheinend die Anschlagtechnik defekt ist. Die Taste ist spielbar, allerdings federd diese nicht mehr in die ursprüngliche Position zurück. Die restlichen Tasten sind voll funktionsfähig. Die Tasche ist nicht in der Auktion enthalten. “This item is sold AS-IS, where is, with no warranty written, expressed or applied – There will be NO refund & returns – NO exceptions. At times, we sell items that are damaged or non functional as there may be parts or pieces needed by others. Selling AS-IS for parts / repairs. Makes intermittent unwanted sounds…. “THIS ITEM WILL COME JUST AS SEEN IN THE PHOTOS, NOTHING MORE, NOTHING LESS. 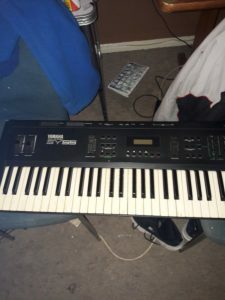 ” Verkaufe aus Platzgründen meinen Yamaha SY 55 Synthesizer. Voll funktionstüchtig, mit leichten Gebrauchsspuren. Eine Taste hängt etwas, funktioniert aber einwandfrei. Nur Abholung in Braunschweig, kein Versand.